It's the ever-lovely Jane Badler. Again*. 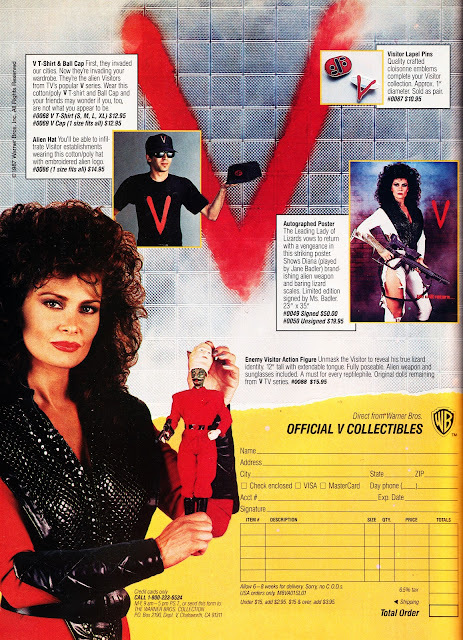 This time reviving her Diana alter-ago to - errr - flog Visitor merchandise (invasions can be expensive business), presumably left clogging-up a Warner Brothers warehouse when V's weekly series killed the franchise in spectacular style. Ironically, most of this stuff (especially the action figure) probably shifts for mega-bucks today. Oh for a time machine. I've always particularly coveted the (frankly stunning) poster. That's one piece of art I'd love to have framed and on my wall. It's not a left-over publicity still either (if they'd have run THAT image in TV GUIDE, the show would still be on the air today! ), Badler reprised Diana especially for the photo-shoot, briefly sparking rumours that Warner Brothers were gearing-up for a revival. They were... until the accountants saw the potential bill. This advert ran for a while in STARLOG MAGAZINE in the late eighties. This particular scan comes from the March 1988 issue.